When faced with big decisions, it seems the right choice would be obvious if you could know the outcome of each path. But would it really simplify things? 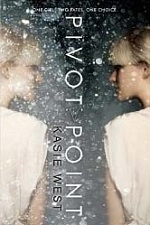 Kasie West takes on that question in her paranormal romance Pivot Point. Addie Coleman lives in a secret compound for individuals with a variety of paranormal skills. She loves her life there, and has the rare ability to “search” the future to see the outcome of her choices. When her parents announce that they are divorcing, and her father wants to live in mainstream American society, Addie searches six weeks into each life to decide which parent to live with. West alternates chapters between the two different futures, each presenting different kinds of secrets, dangers, and love interests. Pivot Point is full of concepts that have been beaten to death in YA — love triangles and arrogant quarterbacks — but West makes them feel fresh. Having the two romances develop independently cleanly sidesteps the “Woe is me! Two gorgeous and amazing boys want me, and my life is just too hard!” angst that can make a love triangle heroine feel whiny and spoiled. Plus, it isn't that hard to know which boy to root for, and I find that straightforwardness refreshing. As for the arrogant quarterback, there are some important world building elements that are tied to his identity as a quarterback, and he's more nuanced than you'd expect. I loved Addie. She is smart, loyal, self-assured, and has a great sense of humor. How can you not love a heroine who tries to win over a boy by passing him a note warning that the zombie of Charles Dickens wants to hunt him down? I should note that there are no actual zombies in this book — she was joking. Wow, these supernatural worlds get complicated. West's plotting was perfect. Even when the two futures bumped into each other, I never struggled to know which future Addie was in. The world building presented an interesting background for the story, but the focus remained strongly on the characters. Pivot Point has been nominated for a YA Speculative Whitney award. The sequel, Split Second, came out in February. West leaves the door cracked for reentering the world, but Split Second does give complete resolution to the series. If you like the romance elements of this series, you should check out West's contemporary YA romance, The Distance Between Us, which is also up for a Whitney award this year. You like the world building of dystopias, but find yourself rather burnt out from “Let's take down the system!” plots. The compound has its secrets and flaws, but the characters simply decide whether to stay put or leave. You enjoy witty dialogue and tasty (but squeaky-clean) romance. You liked Gwyneth Paltrow's Sliding Doors and would like to see a similar concept played out in a YA book. Now that I think about it, half the target audience hadn't been born when that came out. I'm getting old.